Set on 29.2 hectares and located in the leafy suburb of Anna Bay, the Port Stephens region is set to receive a new master-planned community, "Ingenia". Ingenia’s new community will deliver 229 new homes and a $5 million clubhouse for over fifty-fives which is anticipated to include a pool, library, lawn bowls green, cinema, gym and sports bar. “The Ingenia Lifestyle model is unique in that buyers purchase a new, architecturally-designed manufactured home and lease, rather than own, the land,” Mr Owen said. “The First Choice Club registration is a fully refundable $1,500 deposit, with home designs and sites released exclusively to our VIPs before the general public,” Ms Richardson said. 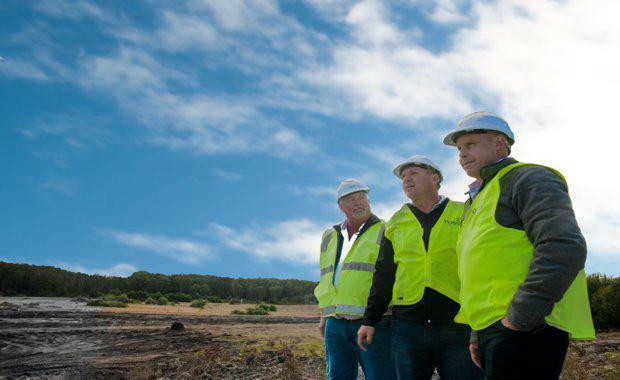 Further demonstrating its confidence in the local market, an approximate $7 million civil works contract has been awarded to local Newcastle company Robson Civil Projects, who will deliver the new community in Port Stephens - creating more than 60 jobs for people across the duration of the civil works. Image: Craig Shepherd (Ingenia Construction Manager), Ed Wortman (Ingenia Development Director) and Simon Owen (Ingenia CEO).